For those of you who grew up in the church, it might be something you’ve never thought about- I don’t know. Until today, I had never thought about it either. If you grew up with Fast and Testimony meetings as part of the weft and weave of your life, you have no doubt heard your parents, most likely your siblings, possibly your friends, maybe even your grandparents or your leaders give thanks for you. Eventually, when you got married, you probably heard your name spoken with gratitude from the pulpit by your spouse. It’s as simple and natural as breathing to be thankful for those we love and include them in our testimonies. When Sister Worden climbed the pulpit today to help her disabled son give his testimony, the last thing I expected to hear, as her son stepped down, was her voice over the pulpit, giving thanks for me. Me, by name- “I am so thankful for Tracy…” I was wrestling with Bean in the pew and my head whipped up in astonishment. She was looking right at me, and went on for just a moment about how she sees me, and how grateful she is for the kind of Saint I am. Tears filled my eyes, and I think I must have been slackjawed. Stunned. 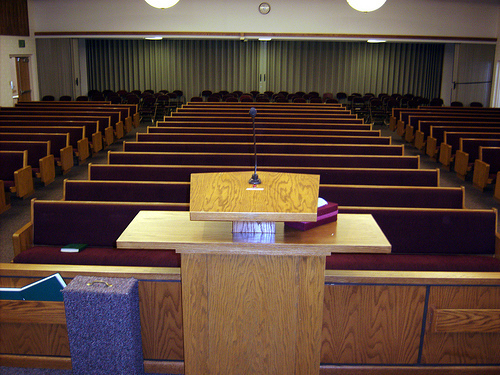 No one, as far as I can ever remember, has said my name over the pulpit as part of their testimony. Waves of gratitude for Sister Worden rolled over me, and I sat there and stared, feeling confused and emotional. I never even realized it was missing. Sister Worden, for whatever amazing reason, zeroed in on me, and thanked her Heavenly Father for me. I could not possibly have made it up to the pulpit to give my own testimony this morning, but let it stand here, I will never forget Sister Worden and the gift she gave me today. we have a family in our ward who have a son with autism. I love it when he bears his testimony because its so pure of imperfections and worldy influences. When giving my Presidency message in Relief Society two months ago, I acknowledged a sister that I’m not really close to in the ward but knew she’d been a great influence on others. Much to my surprise, when she saw me out walking a couple of days later she whipped over, stopped, rolled down her window and told me how much that had meant to her. She’d been “beating up” on herself that day and was feeling guilty, etc., and my unexpected remarks meant so much. I shared with her that as I had looked across the room for women to acknowledge their “good,” she had stood out to me. We were both crying! One of those “tender mercies” we are sometimes given! I’m glad that you got to hear aloud what so very many of us, your readers, think and tell their families. This is great — thank you for taking the time to let us all be uplifted the same way you were by that testimony.